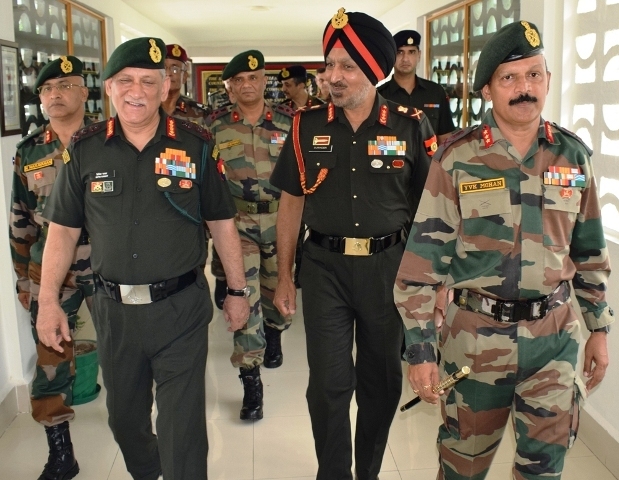 Jammu, July 09, (Scoop News)- Gen Bipin Rawat, Chief of Army Staff alongwith Lt Gen Surinder Singh, GOC-in-C, Western Comd visited Mamun Military Station to review the operational preparedness & interacted with the troops. The Army Chief and the Western Army Commander were received by Lt Gen YVK Mohan, General Officer Commanding (GOC), Rising Star Corps and Air Commodore P Mohan, AOC, Air Force Station Pathankot. The Chief of Army Staff was then briefed by GOC, Rising Star Corps and GOsC of the Tiger & the Gurj Divisions about the operational preparedness & upgradation of security infrastructure. The Chief of Army Staff lauded the morale of the troops & was confident about the preparedness of Indian Army to meet any threat manifested by inimical or anti national elements.